An explosive third period put a nice bow on one of the best regular seasons in Penguins history, as Pittsburgh powered past the Carolina Hurricanes with a 8-3 victory Saturday night at CONSOL Energy Center. It seemed to be either team’s game to win with the score tied at three at the beginning of the third period, but two straight blistering James Neal goals, followed by insurance goals from Brenden Morrow, Matt Cooke and Pascal Dupuis, blew the game open and sent the fans home happy on Fan Appreciation Night. The Penguins’ eight-goal output was their highest mark of this remarkable season. The outcome should go a long way in erasing the bad taste of losing consecutive games while sending them into the playoffs firing on all cylinders. It would be quite rational to think that playing in his first game after missing eight straight with a concussion would be awfully tricky for James Neal. Well, it was … sort of. Neal, who finished with four points (3G-1A), was unstoppable Saturday on his way to a scintillating hat trick that returned momentum to the Penguins heading into the postseason. Neal flew across the ice against the Hurricanes while playing the right wing alongside Evgeni Malkin and Chris Kunitz. His patented snap shot was on full display during the second period on his first goal, when he received a Kris Letang pass in the middle of the ice then sent a blistering shot into the back of the Carolina net. He wasn’t done there, as Neal broke a 3-3 tie early in the third period when he netted a power-play goal. He then earned the trick just three minutes later, as he sent yet another snap shot past goalie Justin Peters. With this being the end of the Penguins’ regular season, Neal wanted to take the opportunity to regain his bearings before entering the postseason. He did that and then some. Paul Martin also made a significant return for the Penguins and put up a good showing. He displayed no lingering effects from the broken bone in his hand suffered on March 28 against the Winnipeg Jets that caused him to miss 12 straight games. Martin spent 23:16 minutes on the ice on Saturday and helped shut down the Carolina power play by double shifting on the penalty kill while Kris Letang and Douglas Murray rotated opposite him. During the Canes’ second power play alone, Martin was responsible for clearing the puck several times while hurrying the Carolina forwards, giving them little space and forcing them into turnovers. Martin also saw power-play time, assisting on Neal’s man-advantage goal. Martin finished with two assists as he recorded another on Cooke’s goal. The Pens’ trade deadline additions continue to impress. 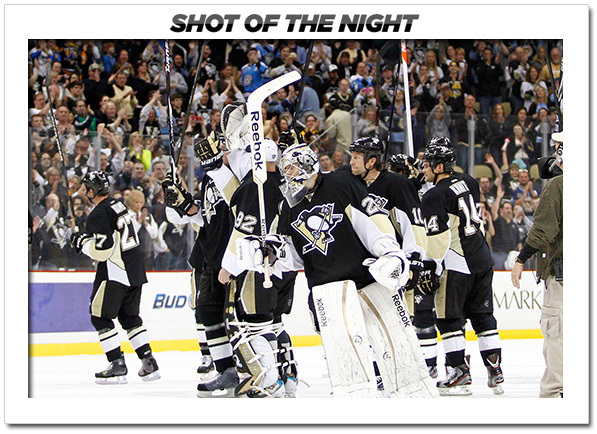 Tonight was former Hurricane Jussi Jokinen’s turn as he tallied Pittsburgh’s third goal of the game. After the puck ricocheted off the boards near mid ice, Dupuis tipped it over to Jokinen who seemingly had miles of real estate ahead of him. He took up every inch of it as he sent a shot on Peters, who collected it, but fumbled it and fell backwards while Jokinen collected his own rebound and flipped it over the sprawling goalie and into the back of the net. In 10 games with Pittsburgh, Jokinen, who hasn’t played in the postseason since being swept by the Penguins in the 2009 Eastern Conference Finals, has collected 11 points (6G-5A) after putting up just the same exact amount of goals, assists and points in 33 games with the Canes this season. Morrow also continued his hot stretch as he sent a wrist shot by Peters to give the Pens a sizable three-goal advantage in the third. Morrow has earned 13 points (6G-7A) in 15 games for Pittsburgh. Former Penguin Jordan Staal skated at CONSOL Energy Center in something other than a Penguins sweater for the first time in his career Saturday and the fans made sure he left knowing he is gone, but not forgotten. In the game’s first television timeout, a highlight reel containing some of Staal’s best moments as a Penguin aired on the jumbotron. After the video package ended, the camera cut to Staal on the Carolina bench while he received a rousing standing ovation. Staal stood and clapped in appreciation; then was called to the ice to help kill his brother Eric Staal’s slashing penalty. As he stepped over the boards, the crowd gave Staal another ovation as he entered the faceoff circle.